This is a game between two teams who have a good reputation in the Euroleague and it is also a game between two sides that come into this game with a 2-2 record. A positive record is up for grabs here and that is always going to ensure that both teams will be fired up at the top of their game for this one. 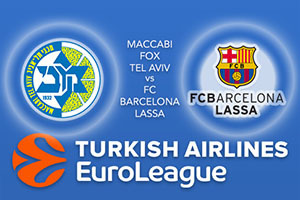 Maccabi may hold a 2-2 record but they come into this game in very good shape after having won two games in a row. This means that the appointment of Rami Hadar has been an immediate success as the two triumphs have come since he has been involved with the team. Macabi know how to score points, they have an average of 91 points per game and this is the second highest total in the league. Both Andrew Goudelock, with an average of 18.3 points per game and Sonny Weems, with an average of 18 points per game rank highly in the Euroleague scoring charts. Devin Smith has also managed an average of 14 points per game so if you’re thinking about scoring when it comes to basketball betting, you have plenty of offer from Maccabi Fox Tel Aviv. A run of injuries has severely disrupted Barcelona’s start to the Euroleague season. The Catalan club can take great pride in only allowing 70.5 points per game, which is the lowest in the league, but they have only scored an average of 71 points per game, which is also the lowest in the league. The absences of Justin Doellman and Juan Carlos Navarro haven’t helped when it comes to scoring points but the fact that Pau Ribas has been ruled out for the entire season leaves a very dark shadow over Barcelona at the moment and the team is unlikely to be at their best at the moment. Tyrese Rice, who used to play for Maccabi, has an average of 12.8 points per game and Ante Tomic has provided an average of 11 points per game. The hosts will fancy their chances in this game and you can see why taking Maccabi Fox Tel Aviv at -4, available at odds of 1.90, will be a decent bet. If you are looking for the Over/Under market, look to go UNDER 159.5 which you will find at odds of 1.90. Bet Now!